When we moved into our house I remember looking at all of the bare walls wondering what I could do to fill some of the empty space. And over time I have hung photos and added many different wall decals to help make it a little more lively and not so plain. I love that you can change the decals as time passes and tastes change (or kids grow older). Make sure you check out some of their products. Hidden in a few product descriptions is a code to save 25% off any product! Now for the giveaway! 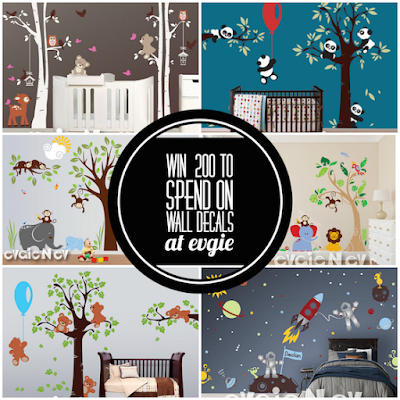 One winner will receive a credit to spend $120 on Wall Decals at Evgie. I love the Birch Tree design. I wouls moat likely get theBirch Forest Wallpapers - Tree Wall Decals with Bonus FREE Birds Stickers . 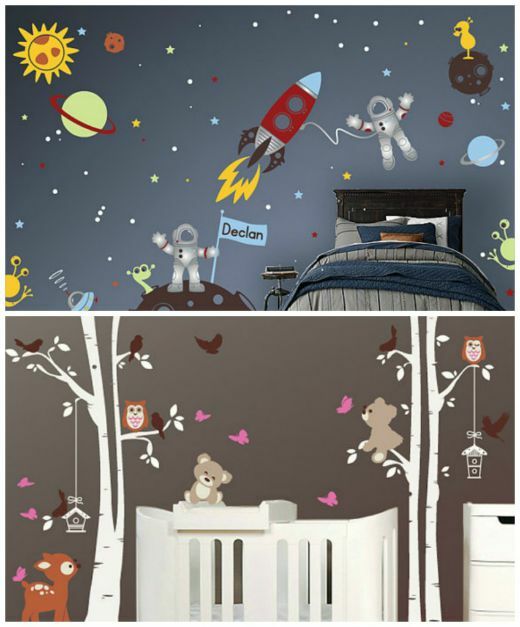 I would buy the Outer Space decals for my grandson's bedroom at my house. Thanks! I would probably get the Under the Sea Nursery decals for my daughter's nurseery. I would probably choose the Children Wall Decal Wall Sticker tree decal - Family Tree with Flowers and Butterflies - Tree Wall Decal for Picture Frames - TRFRM010 because my grand daughter loves butterflies. oh boy I don't know, but I love the Fairy Wall Decals. I absolutely love the Trees with Deer Wall Decals!! so many to choose from.... the delicate woodland design is cute ! Gotta love the Famous Birch Trees with Birds Wall Sticker! I would get the Moose Wall Decals - Trees Wall Decals and Wall Sticker. Thanks. The Moon and Stars Fairy Wall Decals are pretty cute! I love the birch tree wall decals. The Squirrels On the Tree with Birds and Birdhouse is absolutely perfect! So simple, and the colors are my favorite!!! 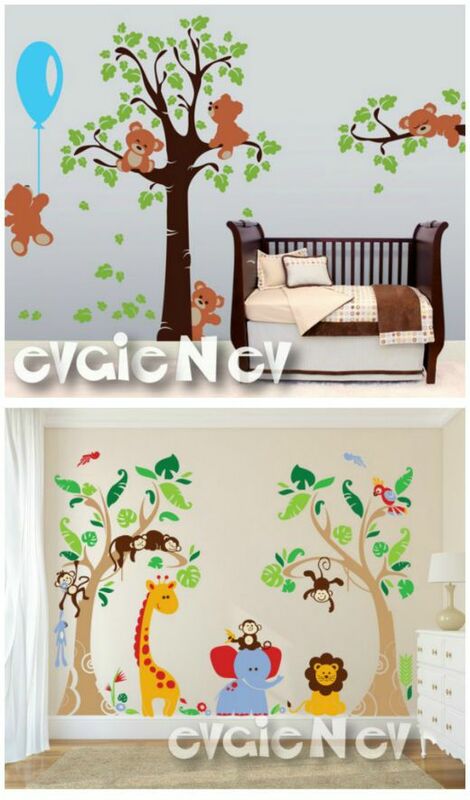 The Safari Growth Chart Wall Decal is very sweet! I LOVE the fairy tree with flowers and stars! it's so colorful! Cherry Blossom Tree Wall Decal - Tree With Birds Wall Sticker.....what a beauty! I'm hoping to get a hold of the Tree with Birdcage and Birds Wall Stickers for when my little girls room is finished! The Dandelion Seeds Wall Decal would look great in any room! 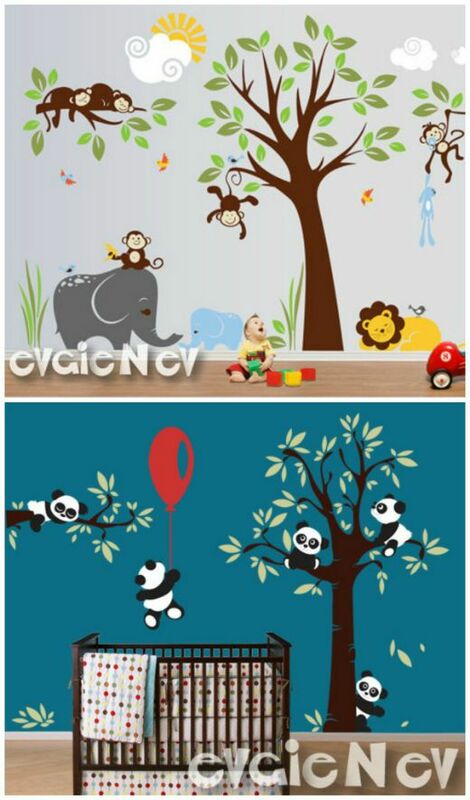 Birch Trees Decal with Owls, for kids is very cute!! Gotta love the Woodland Animals Wall Stickers with Fox and Deer! The Large Tree Wall Sticker (Family Tree) would be perfect for the family room! Polka Dot Flowers look fun! Love the look of the Floating Shelves Tree Wall Decal with Birds and Squirrels!